Naomi Osaka became the first Japanese to win a Grand Slam singles title on Saturday as her idol Serena Williams angrily imploded, calling the chair umpire in the US Open final "a thief". 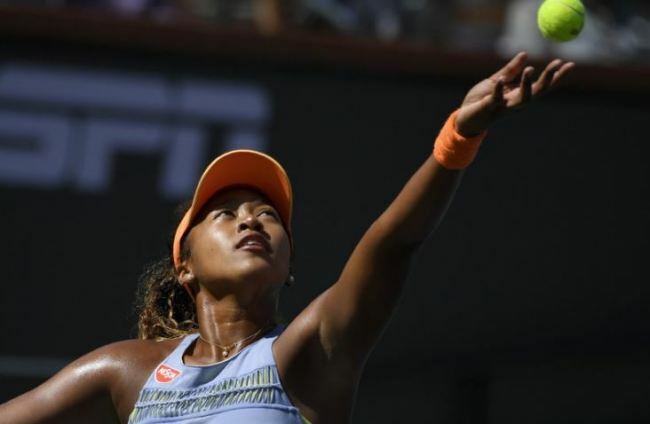 Osaka, 20, triumphed 6-2, 6-4 in the match marred by Williams's second set outburst, the American enraged by umpire Carlos Ramos's warning for receiving coaching from her box. When a second code violation for racquet abuse was handed out to her -- along with a point penalty -- Williams exploded. She tearfully accused him of being a "thief" and angrily demanded an apology from the official. "You're attacking my character," she said. "You will never, ever be on another court of mine. You are the liar," she fumed and Ramos handed her a game penalty for a third violation -- verbal abuse -- that put Osaka one game from victory at 5-3 in the second set. Williams won the next game, and continued her tearful remonstrations with a supervisor on the changeover. But Osaka -- who displayed not only a stellar game but remarkable poise throughout -- held serve to seal a historic win for her country. "It doesn't really feel that real right now. Maybe in a few days I'll realize what I've done," said Osaka, adding that the noise was so great in Arthur Ashe Stadium and her focus so single-minded that she wasn't fully aware of the escalating controversy. "When I turned around it was 5-3 so I was a little bit confused then," she said of the game suddenly awarded to her. "I felt like I had to focus. She's such a great champion so I know she can come back from any point." Williams, seeking a first Grand Slam title since the birth of her daughter Olympia on September 1 2017, was denied a 24th Grand Slam title that would have matched Margaret Court's all-time record. "She played well," Williams said, pausing to compose herself. "This is her first Grand Slam. Let's make this the best moment we can." When it was Osaka's turn she seemed at a loss, apologizing to the crowd. "It was always my dream to play Serena in the US Open finals," she added, turning to Williams herself. "I'm really grateful I was able to play with you, thank you." Williams's outburst overshadowed an outstanding performance from Osaka, who made her second career title a Grand Slam after winning her first at Indian Wells in March. A match with history at stake for both players got off to a tense start and it was Williams who blinked first, double-faulting on break point to give Osaka a 2-1 lead. After a confident hold punctuated by a 106 mph ace Osaka broke again to lead 4-1, silencing the crowd. They came to life again as Williams gained her first break chance, which Osaka saved with a 117 mph service winner. Williams squandered one more chance before Osaka sealed the hold with another big serve. "I don't cheat to win," she said. "I'd rather lose." Coach Patrick Mouratoglou admitted in an interview with ESPN that he was trying to advise her with a hand gesture, although Williams was apparently oblivious. "The star of the show has been once again the chair umpire," he tweeted. Williams was up 2-1 on the changeover when she spoke again with Ramos appearing to smooth things over, and she finally found a way to break Osaka for a 3-1 lead. The tranquility didn't last long. When Osaka broke back with the aid of two double faults and a backhand into the net from Williams, the American smashed her racquet to the court. A second code violation came with a point penalty to start the next game that sent her into orbit. "I didn't get coaching. I haven't cheated in my life. I stand for what's right," insisted Williams as they headed into the sixth game -- in which Osaka held at love. After Osaka broke for a 4-3 lead Williams continued her verbal assault on Ramos, who docked her a game for a third violation that put Osaka up 5-3. The scene recalled Williams's ugly rant at a line judge in her US Open semi-final loss to Kim Clijsters in 2009 and her verbal attack on chair umpire Eva Asderaki in her 2011 final loss to Samantha Stosur. Williams said she didn't know if she would have managed to turn things around if the dispute with Ramos had not occurred.